Also serving communities of Selah. There are 5 Memory Care Facilities in the Yakima area, with 4 in Yakima and 1 nearby. The average cost of memory care in Yakima is $5,250 per month. This is higher than the national median of $4,650. To help you with your search, browse the 6 reviews below for memory care facilities in Yakima. On average, consumers rate memory care in Yakima 4.7 out of 5 stars. Caring.com has helped thousands of families find high-quality senior care. To speak with one of our Family Advisors about memory care options and costs in Yakima, call (855) 863-8283. Yakima is located in the deserts of central Washington and has a population of about 93,700 with seniors at 13.7 percent. 3,622 of them have Alzheimer's disease, while 106,644 seniors across Washington have dementia or similar cognitive difficulties. Yakima's five memory care facilities help support seniors with cognitive impairments. Assisted Living facilities that care for seniors with dementia in Washington are called dementia care facilities, and they must follow the Enhanced Adult Residential Care – Specialized Dementia Care contract. Administrators and caregivers in facilities are required to receive training on serving seniors with cognitive conditions. Also, seniors living in memory care environments receive care that is tailored to their hobbies and interests, with community activities that match them. The law also requires that the families of seniors are given some oversight over their care. The cost of living in Yakima is nearly equal to the national average. Health care costs roughly 20 percent less, housing costs are 13 percent more and grocery costs are about eight percent higher. Finally, transportation and miscellaneous costs are a bit less expensive in Yakima than the national average. Yakima has a high crime rate. Property crime is prevalent, with two to three times more crime than the national average. Violent crime is also notably worse. Outlying neighborhoods have less crime than central Yakima, so those areas are safer for seniors than living in the center of the city. Washington is particularly welcoming for seniors when it comes to taxes. While the sales tax in the state is high, seniors will save money on their income; the state does not tax retirement or Social Security income. Yakima's weather has a comfort score of 71 out of 100, owing to its dry, hot desert conditions from spring through fall. Winters average 20 inches of snow per year; seniors will want to take care during the snowy season to avoid slips and falls. Memory Care costs in Yakima start around $5,250 per month on average, while the nationwide average cost of memory care is $4,799 per month. It’s important to note that memory care rates in Yakima and the surrounding suburbs can vary widely based on factors such as location, the level of care needed, apartment size and the types of amenities offered at each community. Yakima and the surrounding area are home to numerous government agencies and non-profit organizations offering help for seniors searching for or currently residing in an assisted living community. These organizations can also provide assistance in a number of other eldercare services such as geriatric care management, elder law advice, estate planning, finding home care and health and wellness programs. To see a list of free memory care resources in Yakima, please visit our Assisted Living in Washington page. 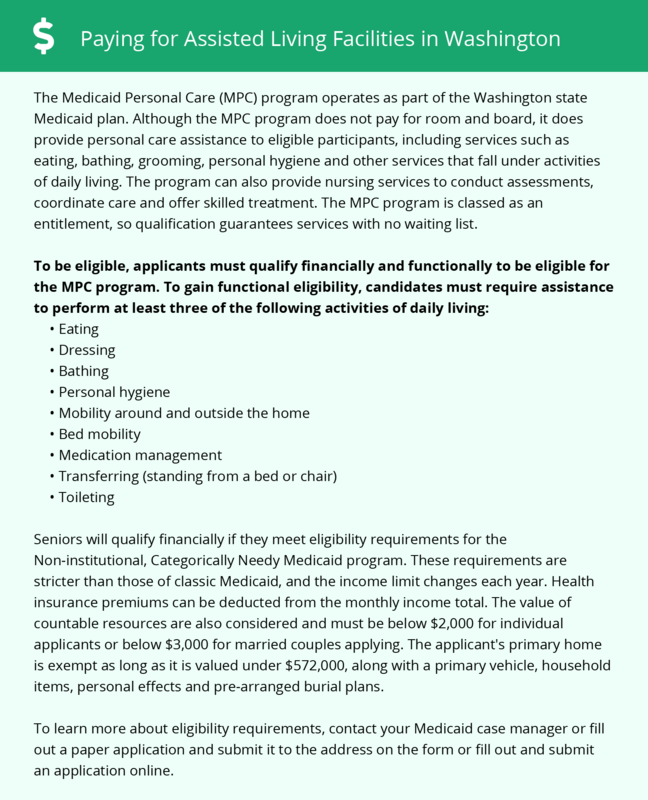 Yakima-area assisted living communities must adhere to the comprehensive set of state laws and regulations that all assisted living communities in Washington are required to follow. Visit our Memory Care in Washington page for more information about these laws.